Since I have recently posted informal mini-reviews/round-ups of the Video Music Awards, the Country Music Awards and the American Music Awards, I seem to now feel obliged (compelled?) to do the same with the tree lighting at Rockefeller Center, making this round-up thing a new tradition of my own. So the tree lighting ceremony production was a little bit loose-r than years past, including Mariah’s décolletage! Whew! That Xmas song of hers is the best, but it may be time to change the dress color, bring up the neckline and just generally tighten things up a bit, don’t you think? Or maybe just get a stylist like everyone-else-and-their-mother-who-is-supposedly- somebody? Her talent is too great to be distracted by the other parts of the package hanging ten! Though I loved seeing my fellow Sacred Heartie Stephanie Germanotta (aka Lady Gaga) up there alongside Mr. Tony Bennett (and she looked and sounded smashing), I thought Music City’s Jason Rucker was among the best, if not the best, of the singing bunch (the country music crowd always delivers the best musical talent). Sara Bareilles and Seth McFarlane also really delivered a fantastic rendition of Baby it’s Cold Outside. Ingrid Michaelson was really out-there, seemed like she might have even been on something other than the high from her off-key notes, and that outfit was the evening version of a hybrid of all the private girls’ school (Sacred Heart/Spence/Chapin/Nightengale/Spence/Hewitt) uniforms blended into one bad evening gown at the Gold and Silver Ball (only New York City kids will know what that is). A bit more dancing could also be thrown in to the production, but at least the Rockettes – a tradition unto themselves – showed up. They never disappoint, though it would have been nice to see a change in outfit for the 2nd kicking! Idina Menzel is an incredible singer and performer, though that song from Frozen should be saved for the 1,000th DVD viewing at home by kids only. Maybe the tree lighting should be held on Monday night when Broadway is dark or at least try to get more song and dance routines from the Great White Way and Lincoln Center? If the A-list like Timberlake or even our own new Welcome to New York ambassador Taylor Swift can’t make it, then tapping the Great White Way, Lincoln Center, and more from Music City would make this the A-list show it is at heart, but just wasn’t there entirely last night, though always an A for effort with the peacock network NBC. The feathers just need to be fluffed a little more for next year. Though I love all of the music, it feels different and somewhat wrong without the ice skaters. As a figure skater myself, it’s not my favorite ice rink (as it’s small), but Rockefeller Center during the winter, and especially at Christmas, has always been all about the ice. When trend takes over tradition, sometimes it veers too far and tonight it went a bit too far, especially when Nick Lachey is the best announcer of the whole Today Show crew (love that guy!!! ), and when the talent is yearning for a true emcee (Ryan Seacrest, anyone???? ), and the newest New Yorker…..Taylor Swift. As a new New York ambassador of sorts, as the biggest star in the industry with the hottest album release out there, wouldn’t you think she would have been in New York to light up the tree instead of strutting the runway at Victoria’s Secret in…… London? Hey, wasn’t that show always in New York??? What happened to that??? Don’t those models all live here??? I know they do! I just saw Karlie Kloss at the Knicks game last week with her BFF (best friends forever who don’t know) Taylor Swift. have gone to it many times over the years….until this year??? Hmmm…..let’s get that back here. “Victoria” might exude British, but isn’t that an American brand?? Let’s get that Victoria back stateside. Hey speaking of lingerie and pajama-wear…. Leann Rimes looked like she was wearing her husband’s bathrobe. Though she showed a bit of a garter and black dress underneath, she never shed it completely and the outfit didn’t even look too exciting for it to be shed. It really wasn’t any better than the first outfit where she was wearing her husband’s lumberjack shirt from LL Bean. At least make the outfits Christmas-y when the Christmas song she chooses to sing is about…….hippos??? And what happened to our new Mayor flicking the switch? I always saw my favorite Mayor (other than Mr. Guiliani), Michael Bloomberg next to the Speyer family (uh, owners of Rock Center?) right next to Matt and the Today Show crew. Even seeing the Speyers would have made it all come together a bit more at the end. Who was that crowd next to Savannah and Matt? With the new Mayor nowhere in sight (I realize the job called tonight with protests looming, and gratefully, none happened at Rock Center), you would think that even a stalwart NYer like Trump or even Kathie Lee and Hoda could have been brought in to liven things up a bit and make it all seem like New York?! Who was that crowd? Couldn’t they come up with at least one boldfaced name instead of the group Today Show hug with Cyndi Lauper and a bunch of other New Yorkers we don’t know? At least then let’s get some children there to enjoy the thrill of lighting up the biggest tree from Pennsylvania that Al Roker brought in on the top of his station wagon! It just wasn’t up to the level of years past, but on the bright side, there were no disruptions, everyone was happy, the songs/carols were all classics, and sometimes casual and not-so-pulled-together, feels like home too. As much as I love Taylor Swift, she is still growing on everyone as an authentic New Yorker (like the tree, she is originally from Pennsylvania) and there is something much more New York about Ole Blue Eyes and the New York, New York anthem we all know and love. In between Swifty and Frank are also Jay-Z and Billy Joel whose New York anthems New York State of Mind and Empire State of Mind would seem likely candidates to perform – even at Christmas. As resident performer at Madison Square Garden, let’s shoot for him next year? And Jay-Z can bring Beyonce and Baby Blue too, and wow – wouldn’t that be something! The most logical choices also seemed to be missing: SNL cast? Brian Williams for his 10th Anniversary to flick the switch??? Maybe with his daughter Peter Pan? Seth Myers? Jimmy Fallon to slow-jam-the-Christmas-tree-lighting-news? We know now that Jimmy had more important new daddy duties to welcome his new daughter to the world, but next year we better see the new dad and host of the new Tonight Show in New York City? Maybe even host that night’s show outside! Now that is the perfect ensemble and none of them has to walk very far at all. We all love the Today Show crew but they are tired from the Thanksgiving Day parade and it was a long day for them. Give them a break and hand over the reins to the king and prince of nighttime! On the brightest side of all: we are emboldened by the evening’s events aways, regardless of the show. 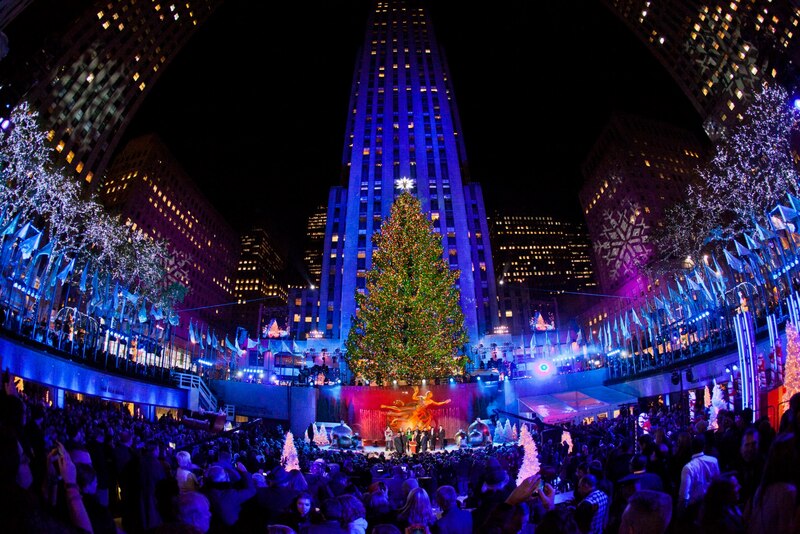 The tree lighting is one of the grandest traditions in New York that is appreciated and enjoyed worldwide. IT always puts us in that Welcome to New York, New York/New York, Empire State of Mind because after all, the tree was greener and brighter than ever, baby it’s really not so cold outside, New York is the greatest city in the world and one helluva town- always, and there is absolutely nothing like New York City at Christmas.